ANDOVER, Mass., April 02, 2019 (GLOBE NEWSWIRE) -- Mercury Systems, Inc. (NASDAQ: MRCY, www.mrcy.com) announced the EnsembleSeries™ HDS6605 blade server, the embedded computing industry’s most powerful, general-purpose processing 6U OpenVPX™ blade server with hardware-enabled support for artificial intelligence (AI) applications. Powered by Second Generation Intel® Xeon® Scalable processors, HDS6605 blade servers feature the same cooling, packaging and 100 Gbps in-system switch fabric interconnect technologies found in earlier proven generations of Mercury blades based on Intel Xeon processors. These open systems-compliant technologies have a technology readiness level of nine (TRL-9), making HDS6605 blades well-suited to rugged defense applications and upgrades that require the utmost in processing capability. HDS6605 blade servers are highly optimized for AI and other extreme compute-intensive general processing workloads typically associated with sensor fusion, complex C4I and deep-learning applications. Second Generation Intel Xeon Scalable processors feature Intel® Deep Learning Boost, which extends Intel Advanced Vector Extensions-512 (Intel AVX-512) to accelerate inference applications like speech recognition, image recognition, language translation, object detection, and more. Its new set of embedded accelerators (Vector Neural Network Instructions, or VNNIs) speed up dense computations characteristic of convolutional neural networks (CNNs) and deep neural networks (DNNs), delivering up to a 14x improvement in inference performance compared to the first-generation Intel Xeon Scalable processor launched in July 2017(1). Along with increased scalability via ultrapath interconnect (UPI) , each blade provides up to 22 cores from a single 1.9GHz device, delivering an industry-topping 2.6 TFLOPS of general-purpose processing power. 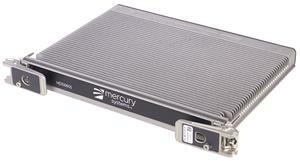 With a 35-year track record of delivering high-reliability processing solutions for defense and aerospace applications, Mercury’s EnsembleSeries blades and other embedded computing servers are known for their long lifecycles, high performance, environmental resiliency, interoperability and SWaP optimization. EnsembleSeries HDS6605 blades are available with up to 100 Gbps in-chassis switch fabrics and optional modified-off-the-shelf (MOTS+) and BuiltSECURE™ technologies for extreme environmental protection and proven systems security engineering (SSE). Open Systems Architectre: HDS6605 blades are OpenVPX compliant and SOSA compatible, making them ideal for technology refreshes and have options for MOTS+ and BuiltSECURE technologies for extreme durability and proven built-in systems security engineering (SSE). Security: BuiltSECURE System Security Engineering (SSE) IP enables turnkey or personalized security solutions that help safeguard against present and emerging threats. Extensible and composable, Mercury’s architectures are built to evolve for future-proofing to maintain system-wide integrity while reducing overall cost and program risk. Additionally, Second Generation Intel Xeon Scalable processors are embedded with Intel’s next generation of security features and resolve known hardware vulnerabilities. Ruggedness: Optional MOTS+ technologies leverage enhanced commercial components, board fabrication rules, and subsystem design techniques for extra durability and ability to withstand extreme temperature cycles and mechanical excitation better than other rugged designs. Scalability: Up to four HDS6605 blades can be clustered via Intel®’s new ultrapath interconnect (UPI) for a truly integrated, low-latency non-uniform memory access (NUMA) server architecture. Advanced Packaging and Cooling: EnsembleSeries HDS6605 server blades are packaged using Mercury’s proven fifth generation of advanced packaging, cooling and interconnects. Collectively these technologies protect the blades from the harshest environments, keeping them cool for long, reliable service lives while enabling consistent OpenVPX switch fabric bandwidths of up to 100 Gbps across a broad temperature range. Applications: With an architecture enhanced for AI processing performance, wider, faster interconnect pipes and 192GB of shared DDR4-2933 SDRAM system memory, HDS6605 blades are ideally suited to complex on-platform applications requiring extreme compute and I/O capabilities, including C4I, sensor fusion and deep learning, which typically require about six times as much memory as a conventional data center-class blade server. Mercury’s EnsembleSeries HDS6605 blades are designed, manufactured, coded and supported in the USA from DMEA-certified facilities and will be available in the second quarter of 2019. For more information, visit www.mrcy.com/HDS6605 or contact Mercury at (866) 627-6951 or info@mrcy.com. Mercury Systems, EnsembleSeries and BuiltSECURE are trademarks, and Innovation that Matters is a registered trademark of Mercury Systems, Inc. Intel and Xeon are trademarks of Intel Corp. OpenVPX is a trademark of VITA. Other product and company names mentioned may be trademarks and/or registered trademarks of their respective holders. (1) On Intel® Xeon® Platinum 8280 processor w/ Intel® DL Boost for ResNet-50 (image classification workload) using Intel® Optimizations for Caffe vs Intel Xeon Platinum 8180 processor at launch.